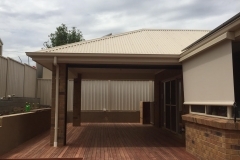 Native Australian hardwoods are an excellent choice for decking because of their high density, toughness, durability and in some instances termite resistant which is great for Australian conditions. At Superb Pergolas N Decks we can custom fit and install a Hardwood Deck to your home in a very short time. We have been dealing in Pergolas and Decks for over 20 years and have a wealth of experience and knowledge which we can discuss in our free quote. Please feel free to view our website for photos to get you thinking of what you would like. Where to use Hardwood Decking? Hardwood decking is excellent for pool surrounds and is a good substitute for concrete and paving materials. It can also be the cheaper option too when looking at designing your pool area. Hardwood Decking can also be used to have a seamless natural flow from indoor to outdoor decking. Decking can also be used for vertical design elements such as fences, gates, screens, steps and seats. Commercial decking is also available for a range of structures where a greater load capacity and wider spans are required. For example we have done many decks for pubs that have the decking blend seamless through to the seats and tables giving it that finished clean look.